Review: Witches', mysteries, spying, and a K9 detective? That's right, a dog who can communicate! Mary Labatt has written a short, yet totally comical, graphic novel. The Witches' Brew is the 4th book in the Sam & Friends Mystery series. The main characters are Sam (a dog) and Jenny. 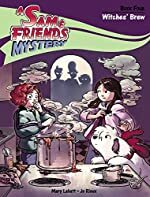 In The Witches' Brew, Jenny, the detective dog Sam, and her friend Beth are getting new neighbors. Three strange sisters move in, and Sam becomes suspicious. She thinks the sisters are Witches'! After coming across some witch books, they feel they have found evidence to prove their claim and Sam and the girls decide to investigate. They strongly believe that the disappearing animals and weird weather have something to do with their evil witch scheme. Strange things keep happening and when another witch arrives, something "terrible" occurs. Have Jenny, Sam, and Beth been put under a spell? I have positive and negative thoughts about this book. To start, Mary Labatt was tremendously creative when she wrote The Witches' Brew. Sam communicates through thoughts, and only Jenny can hear her. Also, the ending is very surprising and unique. I think those are good qualities for a conclusion. As much as I enjoyed this book, I feel there are a couple of flaws. First, there is not enough suspense throughout the book. Despite the one semi-suspenseful part in the middle, the story is pretty predictable. More importantly, the book is very short! I wish there was a little more to the storyline to make it longer. I finished it in about an hour and my younger 7 yr. old sister read it in a day! If you are looking for a longer, in-depth book with a big plot, this 95 page graphic novel should be out of the picture! I know that The Witches' Brew will be an enjoyable book for anyone who likes mysteries or wants to read something for fun and relaxation. Because of the length, I recommend this humorous mystery book to anybody ages 7-10, and I rate this novel an 8 out of 10. We would like to thank Raab Associates, Inc. for providing a copy of Witches' Brew for this review. Have you read Witches' Brew? How would you rate it? Thank you for the fantastic and well-written review!